Qualcomm has revealed new names and tiers for the upcoming 2013 range of Snapdragon processors. The single numeral nomenclature has been replaced by a three numeral range number. Hundreds may sound better and the extra numerals give good opportunity for subdivision, should Qualcomm decide to make more processors within a particular range later on. The current Qualcomm Snapdragon S1, S2, S3 and S4 series was named “to reflect the processor generation”. 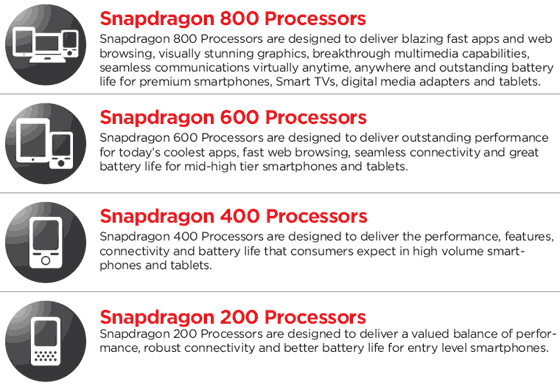 The new processors will be in the tiers; the Snapdragon 200, 400, 600 and 800. See the chart below, it describes in a short and snappy way the capabilities of the tiers on offer. Also you can see in the above infographic, the little icon which gives you an idea as to where each of the processor tiers will be targeted. The low end is catered for the by lower numbered SoCs. HEXUS readers are probably most interested in the higher tier processors; the Snapdragon 600 and 800 series. Both of these series will eclipse the performance offered by the well respected Snapdragon S4. The current S4 Pro uses a Krait 200 CPU with a maximum 1.7GHz clock speed paired with an Adreno 320 GPU and DDR2 RAM. The Snapdragon 600 uses a quad-core Krait 300 CPU with a maximum clock of 1.9GHz, it is still paired with an Adreno 320 GPU but can take advantage of DDR3 RAM. Qualcomm says this processor will “lead the industry in both performance and power efficiency” (until the 800 arrives!) and offer up to 40 per cent better performance that the S4 Pro. Expect to see the Snapdragon 600 in commercially available devices in Q2 2013. The top of the range Snapdragon 800 will use a quad-core Krait 400 CPU with a maximum clock of 2.3GHz, it is paired with an Adreno 330 GPU (2 times better compute performance than Adreno 320) and can take advantage of DDR3 RAM with industry-leading memory bandwidth of 12.8GBps. Capture, playback and display of 4K video is supported. Also the Snapdragon 800 has dual image signal processors supporting up to four cameras. The overall performance increase compared to a Snapdragon S4 Pro is about 75 per cent according to Qualcomm. Expect to see this processor in shipping devices during the summer.